Another voice on the special school inspection debate. Another one I agree with. I read Laura McInerney’s recent Guardian article (http://www.theguardian.com/education/2015/jan/20/ofsted-sen-schools-outstanding) with interest and am pleased that special schools are provoking discussion amongst our mainstream cousins. Laura achieved at least two things with the article: a) bringing the issue to the attention of the wider education community and b) provoking a difference of opinion amongst special school colleagues whose community can sometimes feel like a mutual appreciation society. Remember what mum told you? Yup. Stick to it. It does help your sanity. No work on a Saturday night and choose a time at night where you will always say enough is enough. There is always more you could be doing. Every career change, no matter how difficult they seem, are for the better. If you feel you have to change, go for it. It will work out. Don’t be scared. It’s ok to be emotionally involved in your job. It is a big part of what makes you the teacher you are. Yes there will be tough times and you will cry a lot but it is nothing to be ashamed of. Continue doing what you believe in, even if everyone doesn’t always agree with you. Stand strong. It is good to have strong beliefs. Network! Be nosey, get involved. Talk to others. You can always learn from people. Never lose your enthusiasm for being with the children. They are why you are there. Cherryl says here what I would like to say but better! Did 35% of special schools get an Outstanding last term because they’re fantastic, or because inspectors go easy? A photo or word a day. So back in 2007 after an ankle injury I started taking a photo a day. I managed 3 years of photos. They are a great record to look back on In 2014 I tried again and managed 6 months. Taking photos every day made me look at the world differently. It meant people around me got used to the camera being around. So many moments to treasure. I lead a busier life these days and I know I wont manage it. However I’m going to try and blog the ones I do manage. They may be something and nothing to most but will mean something about my day. Christmas dinner with the inlaws today. 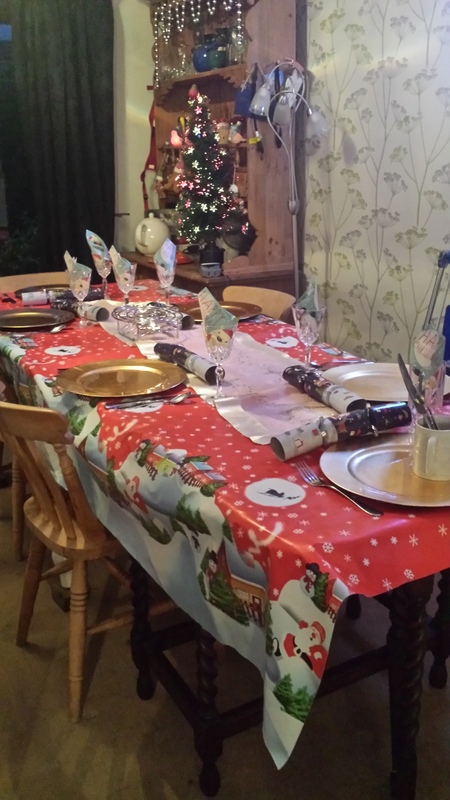 Here’s the table ready for us! The meal was delicious.